AMOK! 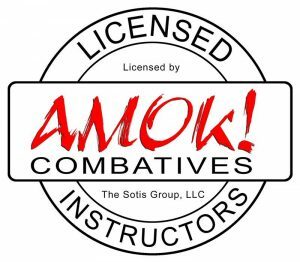 Combatives uses only one set of blade-based actions to fight with, and against, every hand-held weapon or with empty hands. Where the term one mind, all weapons is not an ideal, but very real. Consequently, the knife is the ideal and logic starting point for all combative training because if you learn knife tactics first, every other weapon becomes a simple matter of handling skills; what you won’t have to do is learn different tactics to fight with or against different weapons. Focus courses expand upon the information in the knife courses. Focused courses build on skills with tactics like; – attacking – counter-striking – faking – trapping – quartering – disarming – struggles – take-downs – reverse-hold – tactical footwork – outnumbered and more. AMOK! was founded by Tom Sotis in 1992 in Easton, Massachusetts, USA. Initially organized as the International Blade Fighters Guild (IBFG) and was comprised of several knife arts. Within a few years, we suspended practising and teaching all previously learned methods and developed an ultra-functional methodology called AMOK! Combatives. We are presently the world’s leading edged weapons training company.